I got winded while hiking up a hill the other day. I'm being generous by calling it "hiking up a hill." It was more like walking up a small slope. I try to stay active so I generally don't get winded like that and I admit, it freaked me out. As is my custom when this happens I overcompensate and resort to actual exercise. I hate exercise. However, I would never survive on a diet and the very thought of a gym makes me miserable. 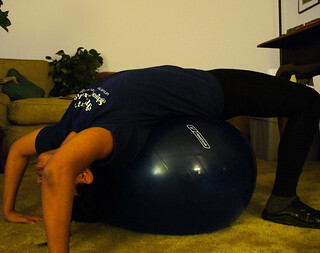 A little time with the excerise ball seems like a passable alternative.